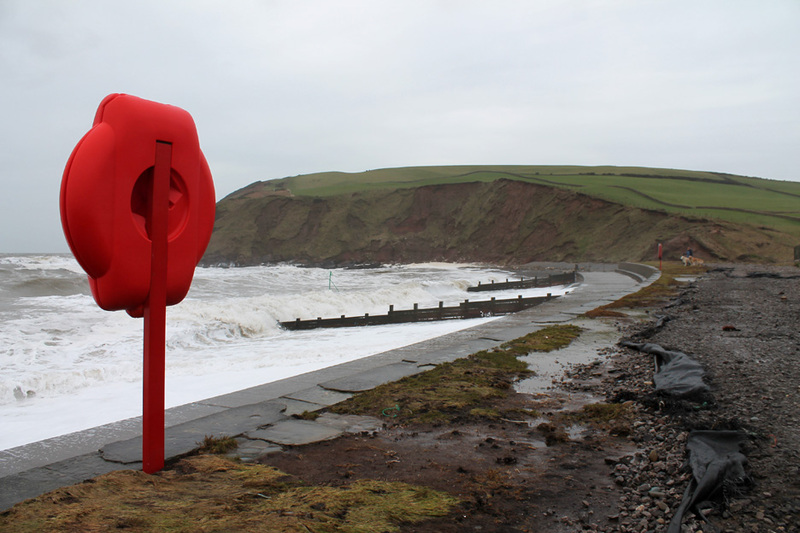 " St Bees and Whitehaven in a Blow "
Date & start time: Friday 29th January 2016 2.30 pm start. 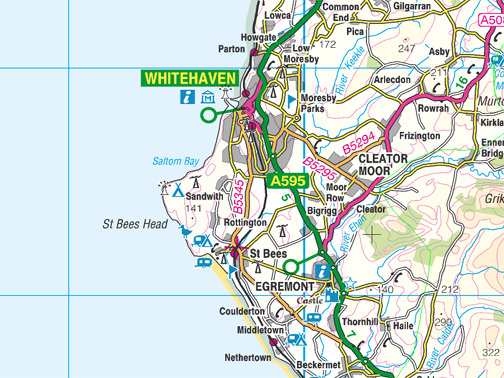 Places visited : St Bees, South Head (Tomlin) and back .... then over to Whitehaven. Walk details : 1.4 mls, 275 feet of ascent, 1 hour 20 mins. Highest point : South Head 275ft - 85m. Weather : Overcast and grey with a strong breeze. 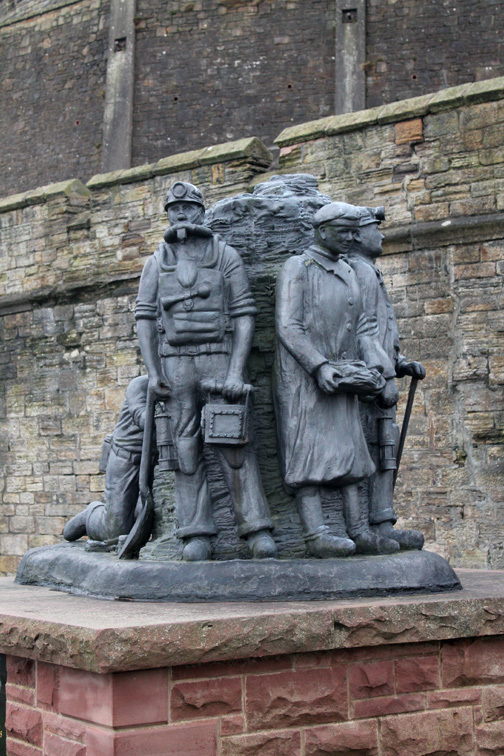 as they reached across the Irish sea towards Cumbria. 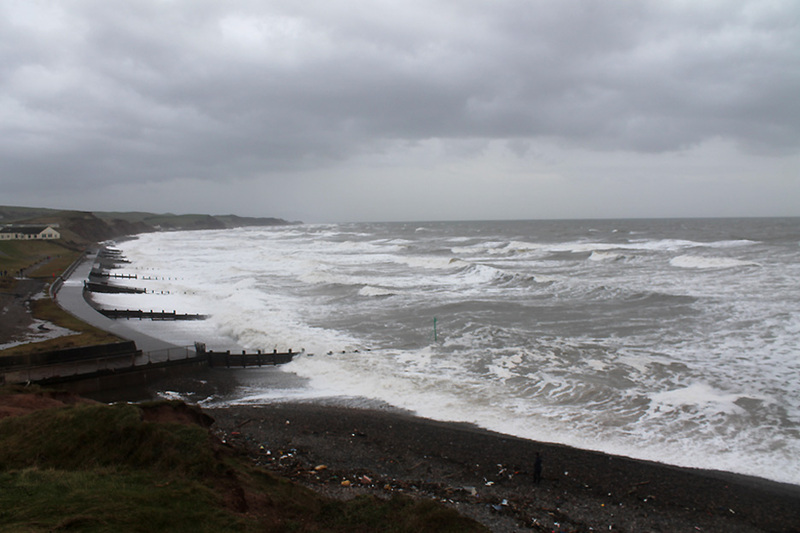 We arrive at St Bees by car on the road from Egremont . . . thus giving us a view north across the bay towards the famous headland. 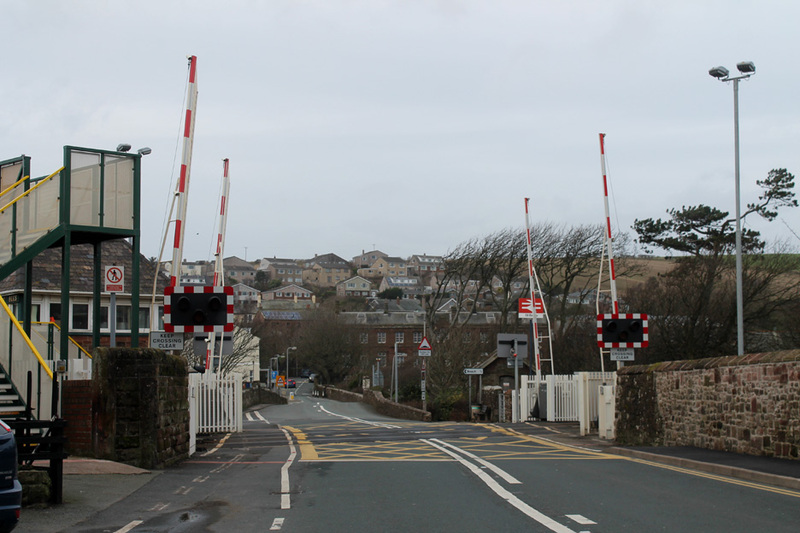 The Cumbrian Coast railway crossing in the centre of the town. 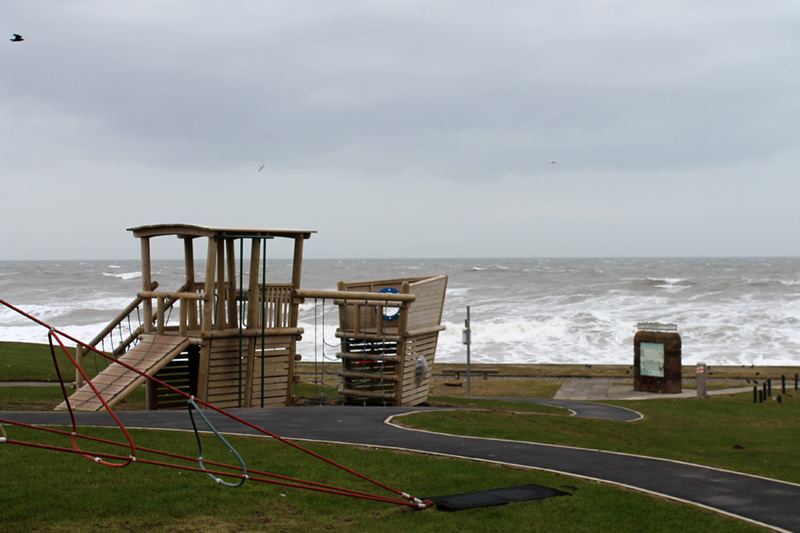 We parked by the beach, next to the new children's play area. 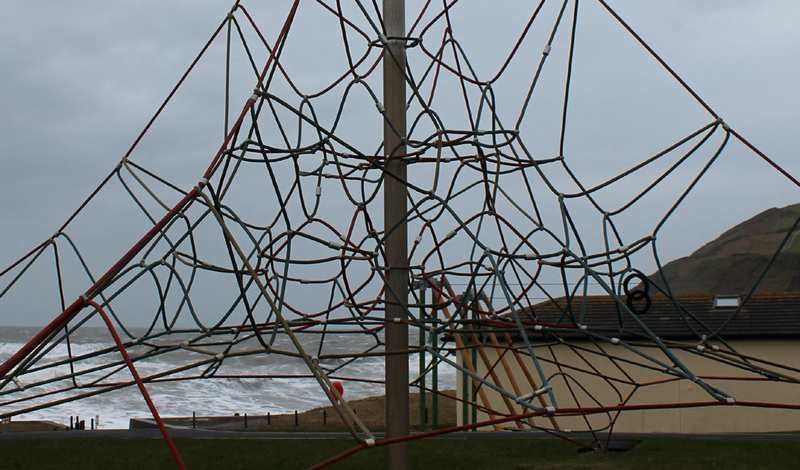 This jumble of wires is a new style climbing frame for children up to 14 years old . . . that's me out then. A pirate boat looks out over the bay. 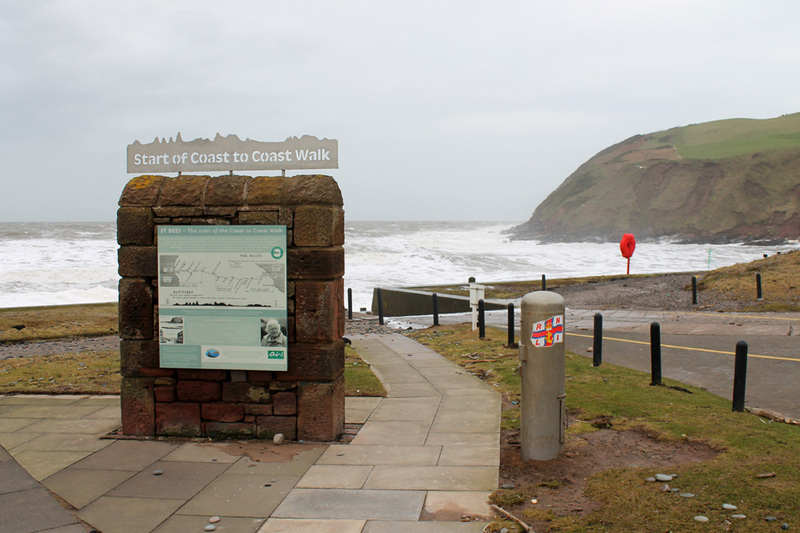 St Bees is the start point of the Wainwright Coast to Coast Walk. Already the errant pebbles on the grass gives a clue to the weather over the last few weeks. It is high tide as we arrive . 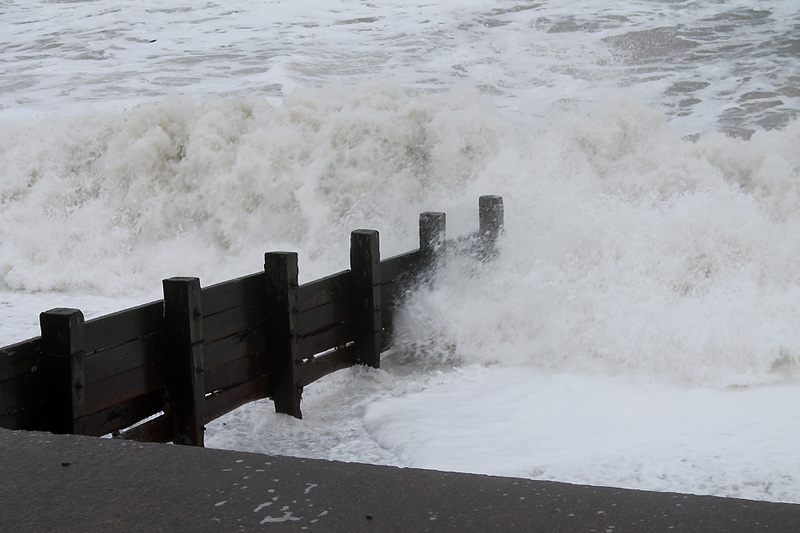 . . and the waves are crashing against the top of the promenade. 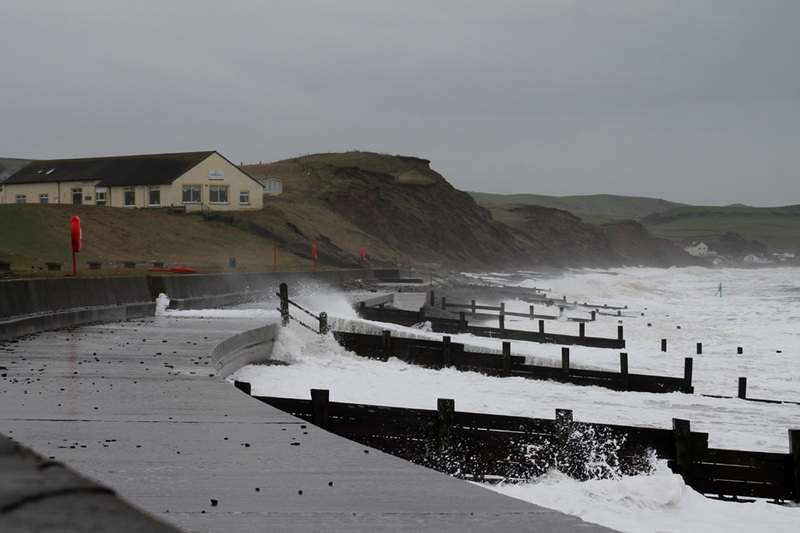 The black matting on the right has been exposed by the waves that have crashed over the sea front in recent days. 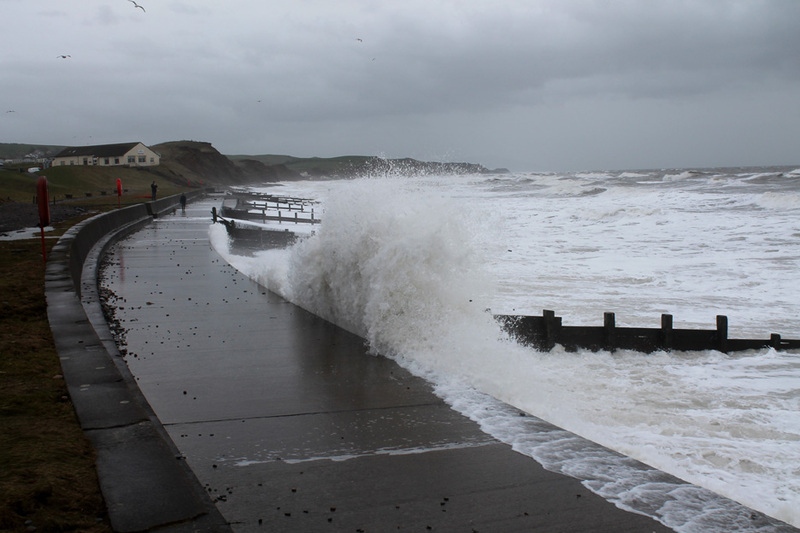 The waves start way out and here the lifeboat slipway allows the water to slide up all the way to the wall. The wooden groyne tries to prevent 'longshore drift' of pebbles and sand. The final wall before the grass is about five foot high . . . the step makes a fine seat on a sunny day. The cafe on the bank above is open . . . the only sign of commercial life on the seafront today. Time for a short walk in the cold wind . 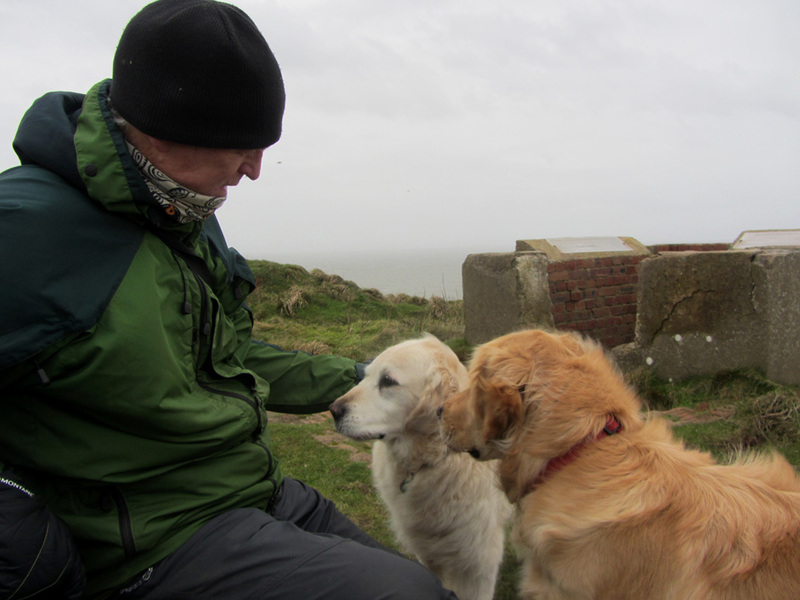 . . so we set off towards the headland. 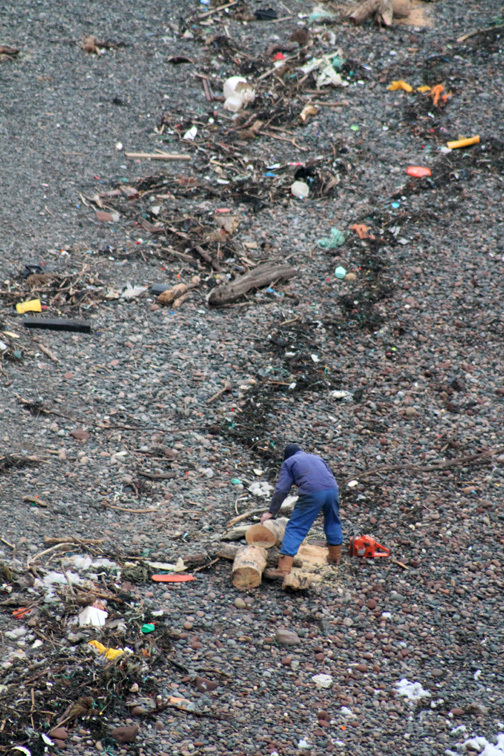 The stones at this end of the beach are covered in vast quantities of sea-bourne rubbish . . . very sad. 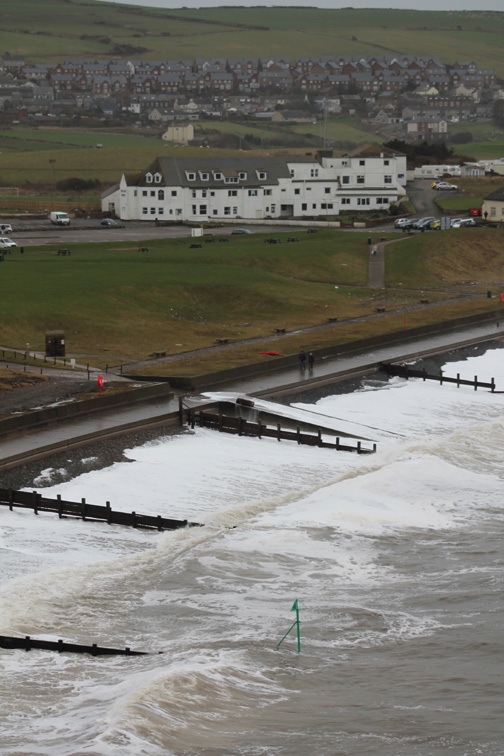 The natural sea foam on the left is being blown into the Rottington Beck which reaches the sea at this point. We've crossed the new footbridge and started our short climb up onto the headland. 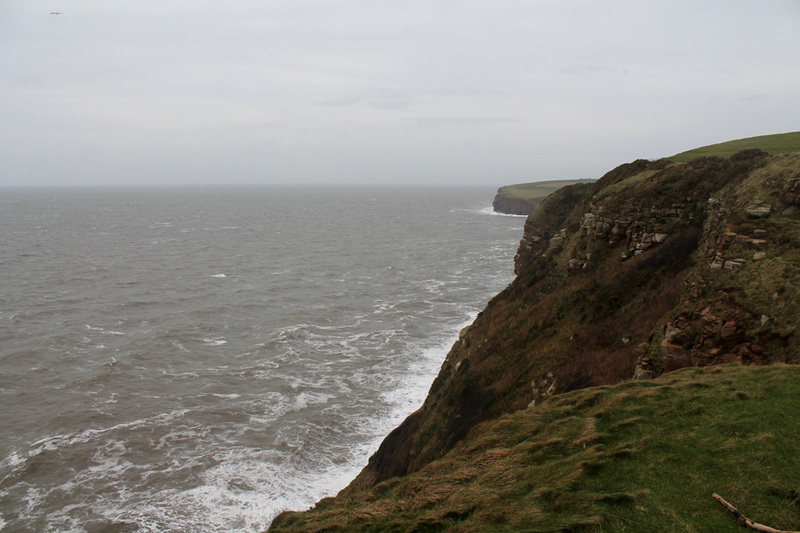 Moving carefully across to the cliff edge . . .
. . . to where the ground collapsed several years back. 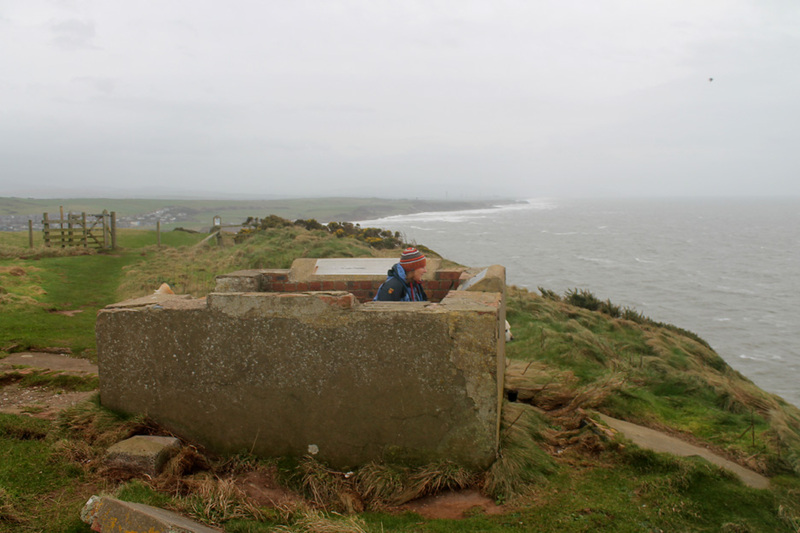 The South Head of St Bees headland is the site of a war time coastguard lookout post. Though derelict now it does have modern diagrams to inform you and highlight the views available on a good day. In the distance is the North Head . 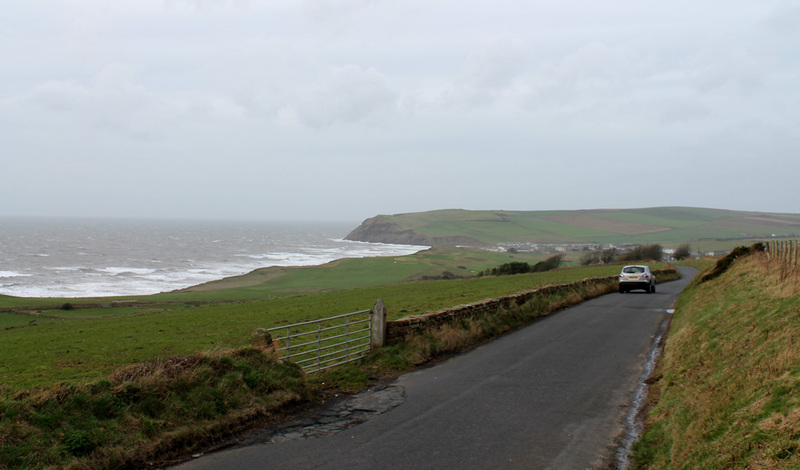 . . which is the location of the St Bees Lighthouse. With the bigger lens in place we can make out the light and the associated buildings. 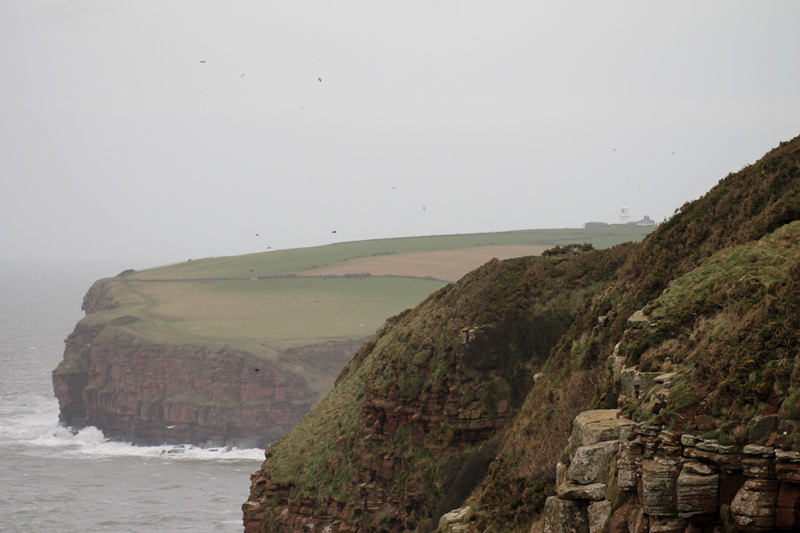 St Bees is famed for its seabird life but today there are only crows and seagulls in abundance. No rarer breeds and nothing perched on the rock faces. 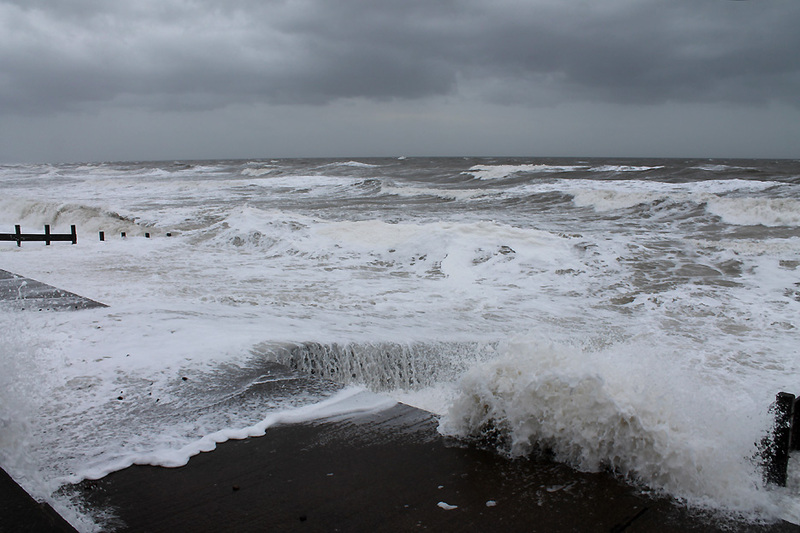 Doesn't matter what lens you have today, you still won't see the Isle of Man. 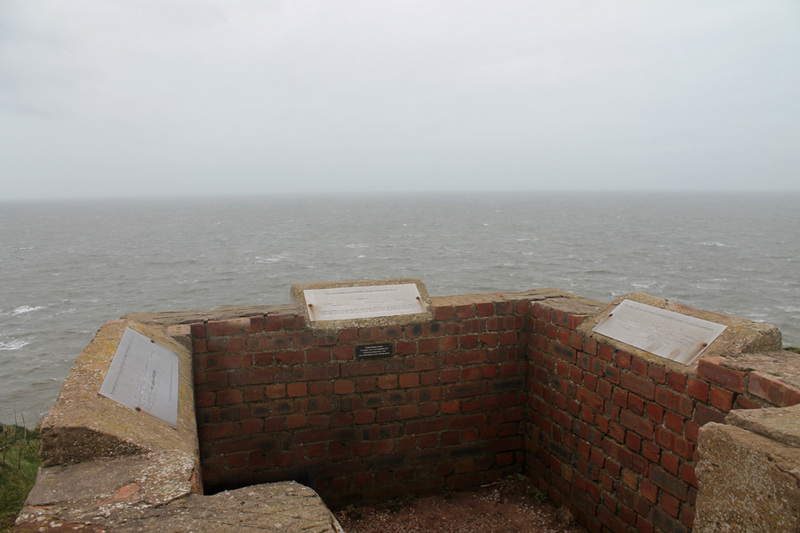 Set back a few yards from the wildness of the cliff edge is a memorial seat. Just those few yards further back makes all the difference and it is calmer world out of the wind. No great plans to go further so we turn and retrace our steps . 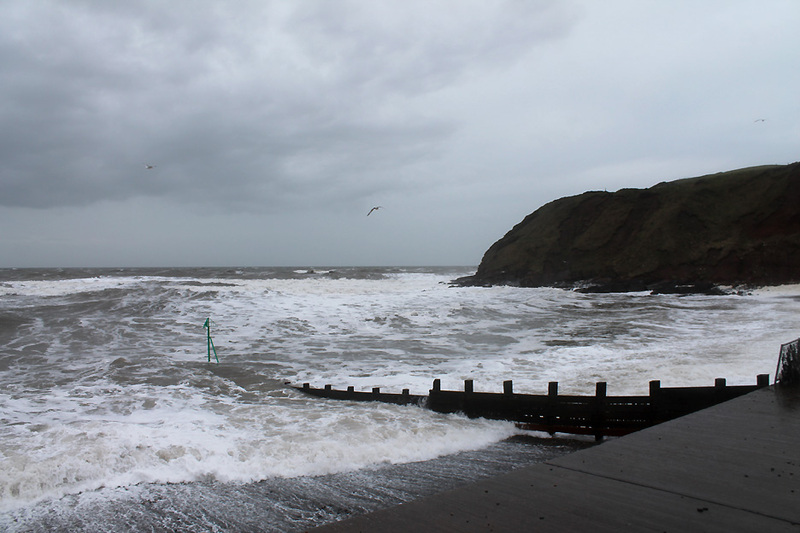 . . back to St Bees. One man taking advantage of a free wood supply. 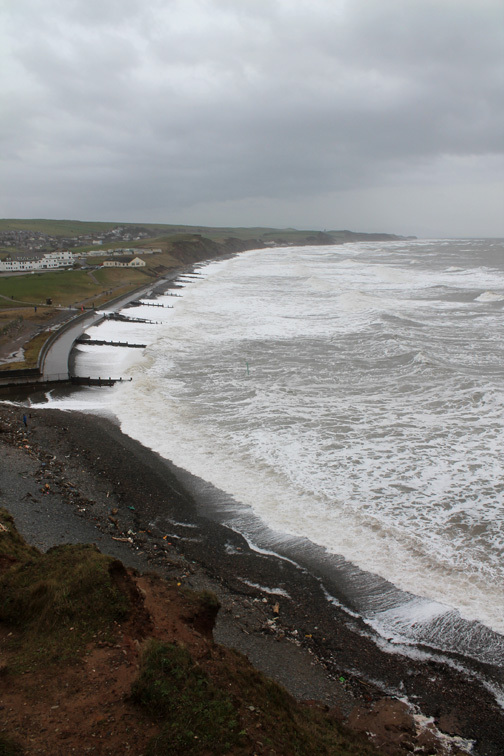 Looking down on the almost deserted promenade. 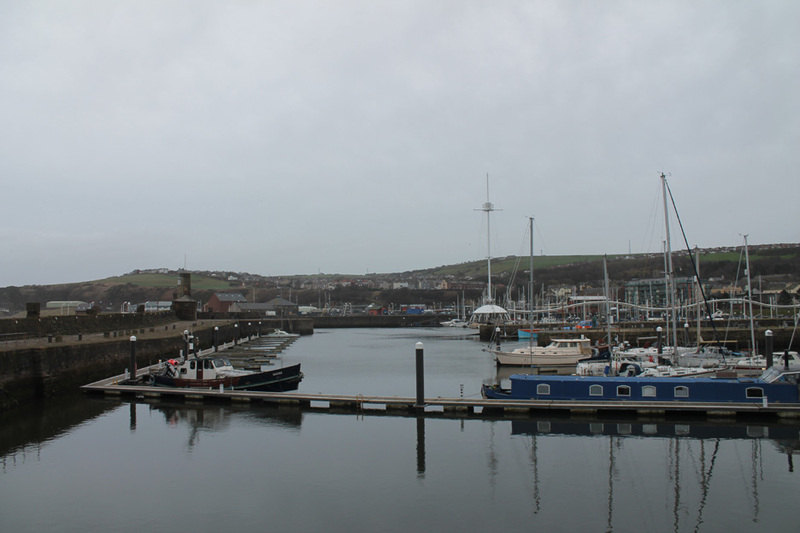 Rather than drive straight home we drove up the coast slightly to Whitehaven and its harbour.
" 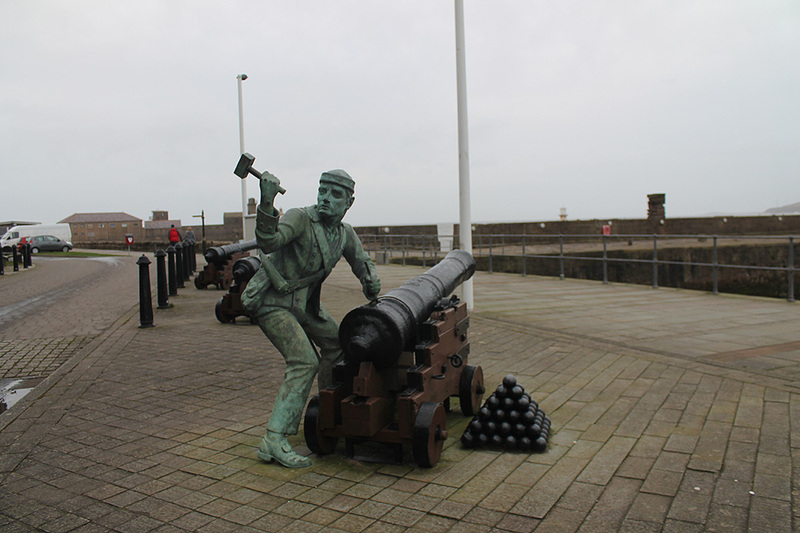 Spiking the guns at the Half-Moon Battery "
The sculpture on the dockside harks back to the invasion of Whitehaven by John Paul Jones and the American Navy in 1778. 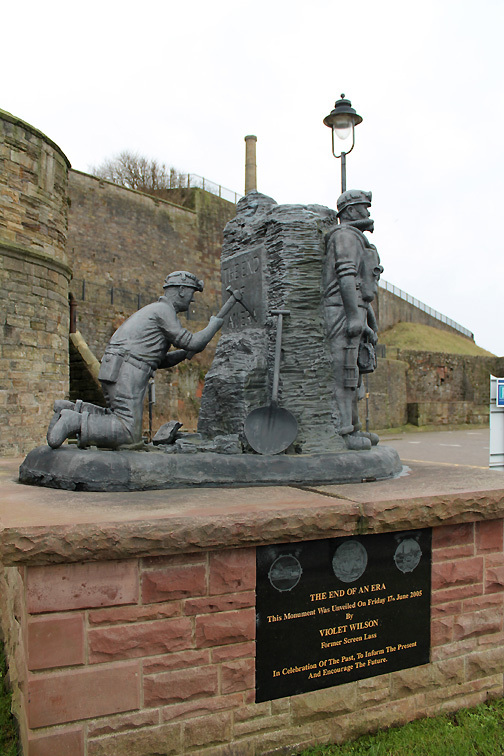 The adjacent sculpture marks "The End of an Era" . . .
. . . celebrating Whitehaven's Coal Industry, now a relic of the past. 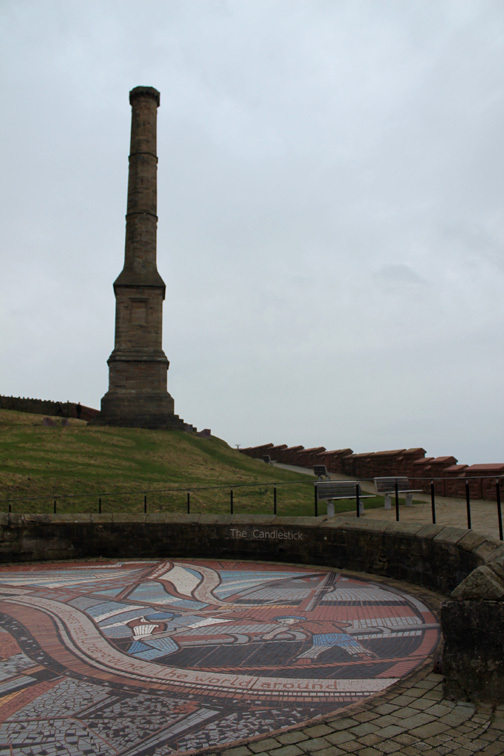 This area of the headland still holds the signs of the Wellington Coal Mine and its famous "Candlestick" chimney. The view of the docks at low level . . . note the old converted lifeboat and a blue, possibly sea-going narrow boat (?). rather than a conventional chimney. and died at the mine. found at the bottom end of town. From there you get a better view over the harbour. 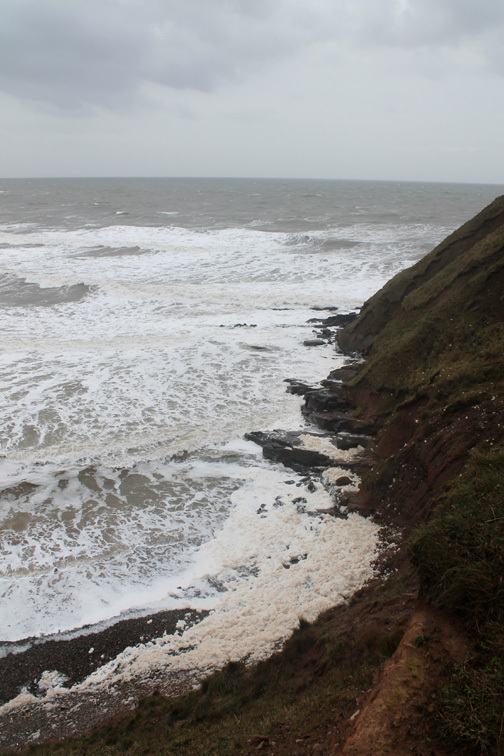 Strangely the sea around this part of the coast was no were near as rough as at St Bees. 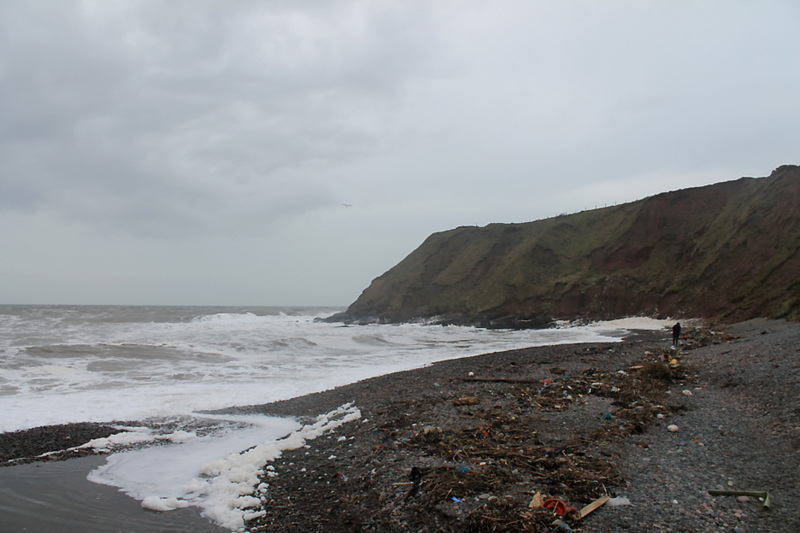 or the wind and sea swell is more southerly than we had thought and the headland is providing much welcomed protection. Time to be heading home on this rather grey day. This site best viewed with . . . the green of Loweswater rather than the grey of the "big city".